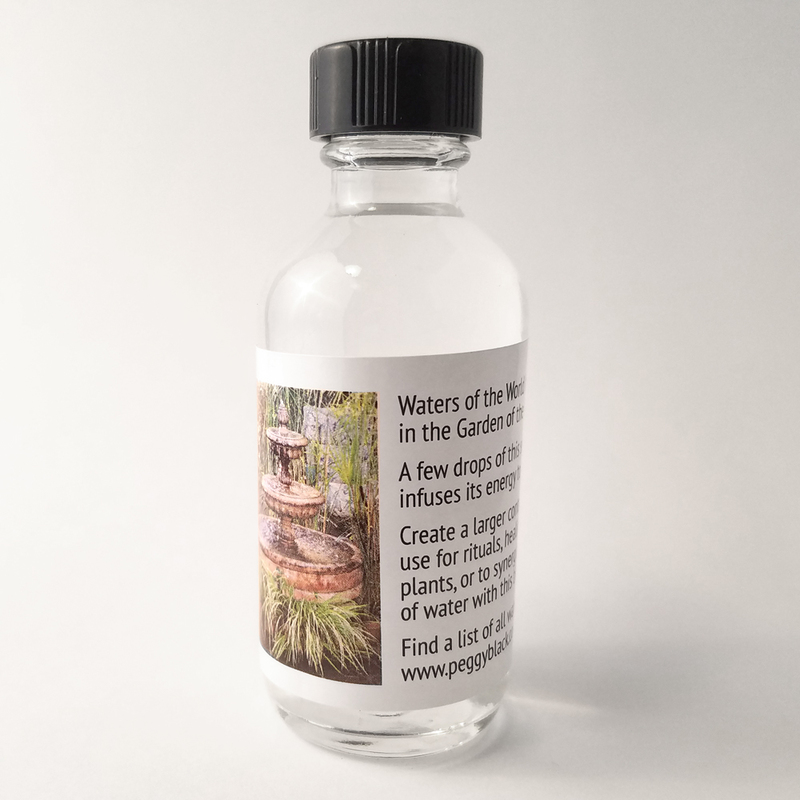 A few drops of this seed water will infuse its energy to any water. Create a larger container you can use for rituals, healing, adding to the bath, watering plants or to synergize any body of water with this blessing. Imagine that this small bottle of Waters of the World carries the energy field, memories and imprints from its source, the streams, oceans, wells or sea. This water is the vibrational blending from all sources around the world. It offers its codes, information and blessings. I have been collecting the Waters of the World since 1992. I had a small bottle of water collected from Healing Springs all over the world by Patricia Cota-Robles. I was living in Saudi Arabia at the time and took this Sacred Healing Waters and added it to the Persian Gulf. 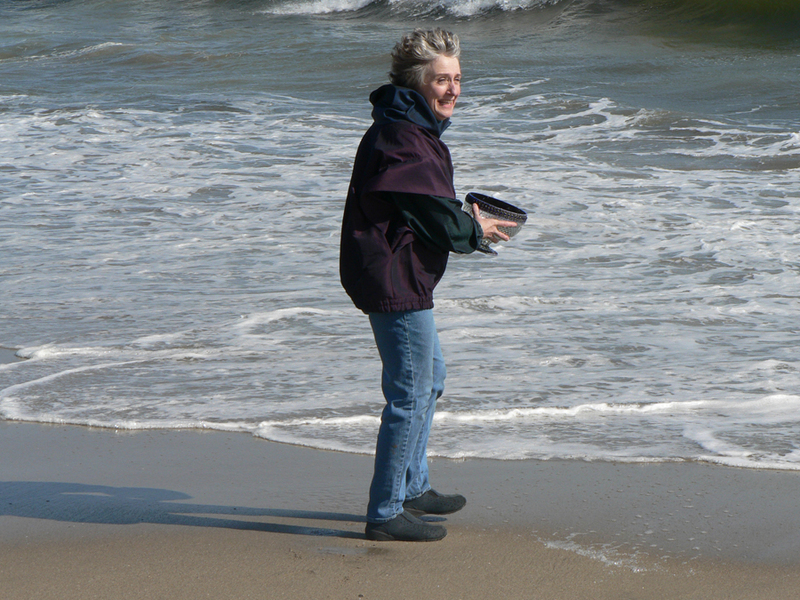 Since that time in all my travels I have always collected a small amount of water from streams, oceans or sacred wells. I had all these bottles of water labeled and in 2000 I created the Courtyard of the Goddess with a fountain in the center. I infused this fountain with all the different waters I had been collecting as well the waters others had brought to me naming this blending, the matrix “Waters of the World”. We are becoming more and more aware of the true nature of water. We know that all living things need water to survive. What if water was a carrier of information? What if the waters from streams, rivers, oceans carried the imprint of the energy field or the memory of its journey? Consider the possibility that each drop would imprint it vibrations with any water that it merged with. Research has shown that water is a liquid crystal with a pliable lattice matrix that is capable of adopting many structural forms. The structure of water gives it an infinite capacity to store information within its matrix. There is a growing body of water’s role as mediator between the energetic and material worlds and its function as an accumulator, transmitter and transducer of energy patterns and information. Institute of HeartMath and HeartMath Research Center. Water is life. As the planet is blanketed by nurturing salt seas and fresh water concourses, so are our own bodies, and those of all plants and animals, created from and provided for by water. 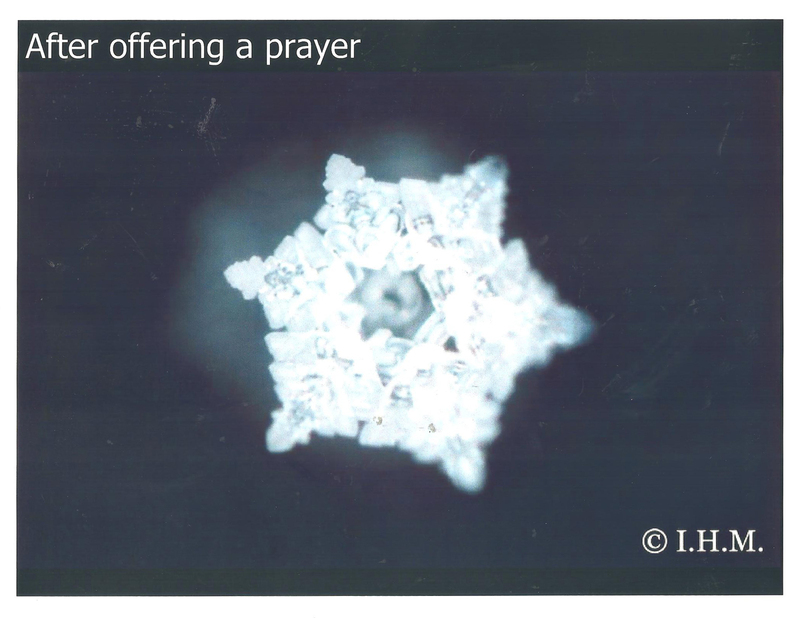 We are bound to it and it to us so strongly that, as was discovered by Dr. Masaru Emoto, the vibrational energy projected by humans in the form of thoughts, words, ideas, intentions, and sounds has the power to alter water’s molecular structure. 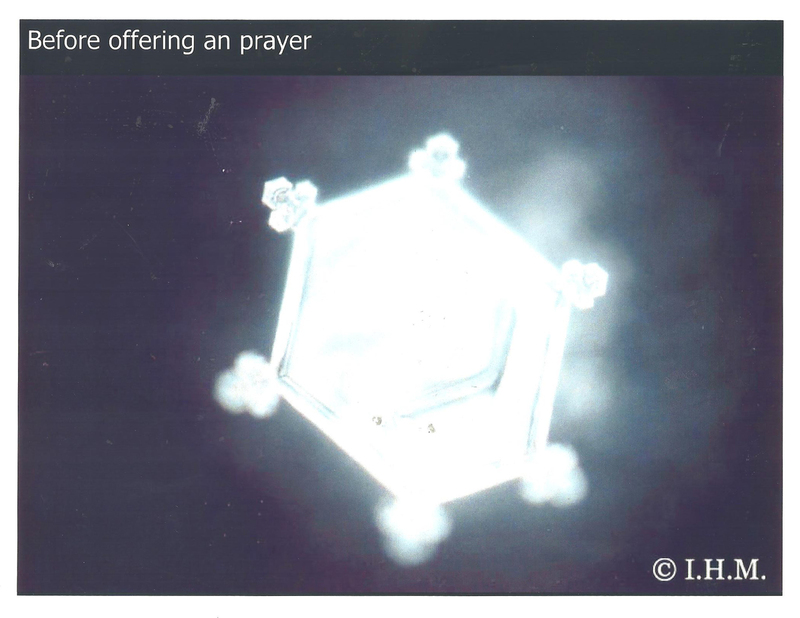 Dr. Emoto was working with magnetic resonance fields when he realized that the unique crystalline forms assumed by frozen water indicated that the water bore the imprint of not only its physical state, but also its spiritual surroundings. Inventor, Dr. Konstantin Korotkov and researcher P. Krishna Madappa work with the Electro Photo Capture (EPC). Also known as GDV (Gas Discharge Visualization), this equipment allows them to observe and analyze the Bio-photon emissions of water. Many books and much research is being done regarding the power and potential of water, this substance that we take for granted yet is necessary for all living things. Water is Holy. Water is holy…it is life. the deepest sea creature to the winged ones. Every living thing depends on this sacred source. Changing and transforming every surface it touches. This powerful force sculpts our landscapes…our coastlines. Yet it can be as gentle as morning dew upon a rose bud. Water is holy ….it is life. It can shape shift, it can morph, steam to ice…solid to fluid. This essence moves through us, it moves through our world. It is the common liquid thread that weaves humanity together. It is the carrier of our consciousness. It should never be bought. It should never be sold. 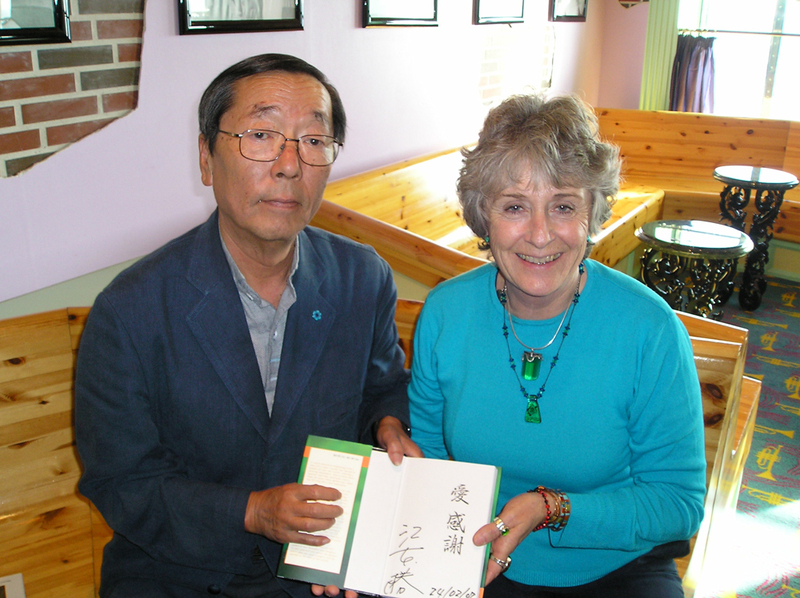 Images of the Waters of the World in a chalice that Dr. Emoto photographed. A photo was taken before the participants of the Gratitude Cruise prayed and energized the water and another photo was taken after. Both are beautiful however you can see the enhancement after the energy intention. The water in this container is called “WATERS OF THE WORLD”. 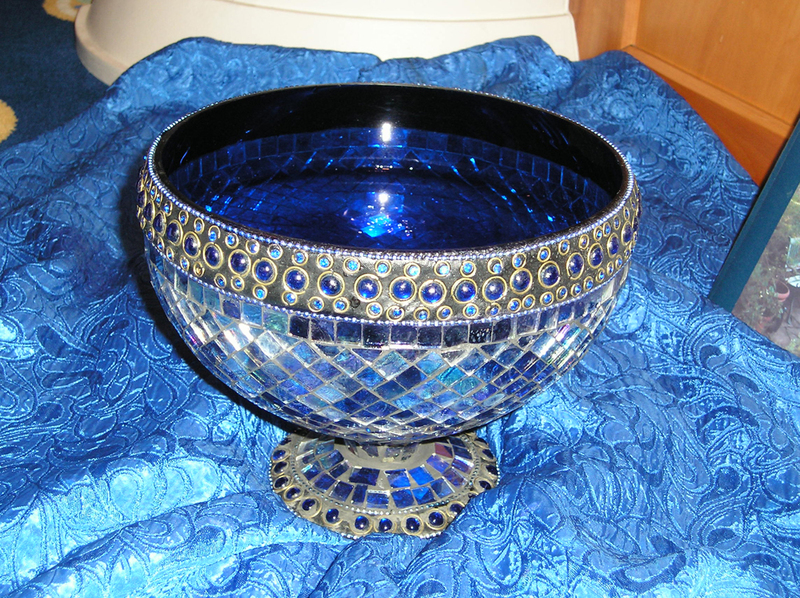 It has been seeded from the water of sacred sites and sacred wells around the world. It is truly “WATERS OF THE WORLD” dwells the fountain in the courtyard of the Goddess in the Garden of the Beloved, Felton, California. * Please forgive if some of locations are vague, often water has been left on my porch or sent in the mail with a simple word “from Mexico” or “a stream in Vermont”. This list is meant give you an idea of the many locations that have seeded the water. ARGENTINA: Perito Moreno glacier water. AUSTRALIA: 5 million year old well/Palm Valley, Gunlom Kakadu, Valley of the Blue Water, Sacred Water Mt. Olga Gorge Outback, Aboriginal Healing Springs Mossman Gorge, Tasman & South Sea, Indian & Pacific Ocean. BOLIVIA: Three springs on the Island of the Sun, Lake Titcaca, St. Francis Church of Copacabana. COSTA RICA: Fountain of the Black Madonna. 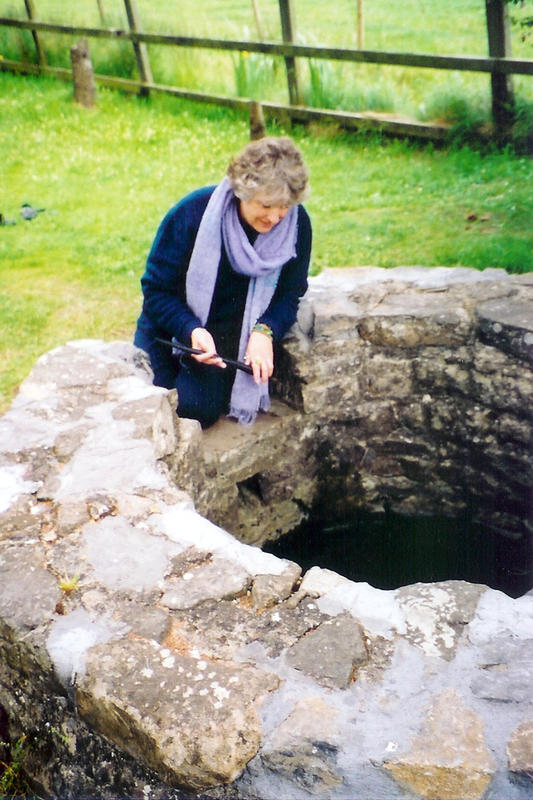 ENGLAND: Glastonbury Tor, Chalice Well, Stonehenge, Averbury, Silbury Hill, Crop Circles, Blagdon Lake, St. Michael’s Mont., Healing Waters of Alhambra, Sacred Spring on Holy Island, Holy Well Sanceed in Cornwall, St. Nectan’s Waterfall, Trethevy, Tintgel in Cornwall. EGYPT: Nile River, Initiation Wells at Karnak/Luxor, Dendara and Abydos, Copic Monastery of the Holy Virgin St Mary, Church of Disciples, Monastery of St. Antony, St. Mark Coptic Church Cairo and Alexandria. ESTONIA: Sacred Spring Water old Estonian Monastery in Kuremae. FRANCE: Lourdes (the Miraculous Grotto), Rennes-le-Chateau St Magdalene Church, Rennes-le-Bains, Mt. Bugurach, Camac, Mont Saint Michel/English Channel, Healing Waters from the Sacred Cave of Mary Magdalene, Sainte Baume in the South of France. IRELAND: Blarney Stone, New Grange, Knowth, Downth, Hill of Tara, Hill of Slkane, Holy Well of Mary/Kenmore, Healing Water from Springs in Iravi and Donne, St. Bridget’s Well, St. Finians Well, Sea Temple, Liffy River of the Goddess, Burran Cave Water, Insih Mor-Dun Angus, Bridget’s Well/Mullingar, Bridget;s Well/Kildare, Bridget’s Well/Lizcannoe, Dingle Ford, Red Chalice Well, Clear Chalice Well, Saint Lazair Well, Toberant Well, Tara Well. ISRAEL: Church of the Holy Sepulcher, Church of the Dormintion of Mt. Zion, Garden of Gethsemane, Church of Mary Magdalene, Dome of the Rock, Western Wall/Wailing Wall, Sea of Galilee, Mt. Hermon, River Jordan Mt. Beatitudes, Nazareth Church of Annunciation. MEXICO: Tlacote, Palanque, Chichen Itza, Res Zapotes, Gulf of Mexico, Aque Soo, Caribbean, Bimini. NEW ZEALAND: Lake Rodopunamu, Lake Taupo, Fox Glacier, Waikorpopupu Springs, Sacred Blue Lake. (Aramaic for “Come Lord Jesus”) Spring/Seven Hills, Water from Serpent Mound. PERU: Lake Titicaca, Rivre of the Sacred Valley at Machu Picchu, Wilkita Valley. REPUBLIC OF SOUTH AFRICA: Sacred Zulu Healing Water from Indian Ocean. SCANDINAVIAN COUNTRIES: Sa Ana Mountain Radiates thought Finland, Sweden, and Norway. SPAIN: Christopher Columbus Momument-Barcelona harbor, Olympic Fountain/Olympic village, Cathedral Santiago de Compastela, Finisterre at Galico. TIBET: Lake of Compassion, Well of Sacred Healing Water, Lake Manosavar, Spring of Khandro Yeshe Tosgyal. TURKEY: Sacred Well of last home of Mother Mary, Sacred Well at Meryemana in Ephesus. the Mediterranean, washing fountain at the mosque in Konya where Rumi is buried, Spring of the Virgin Mary near Ephesus/Selcuk, the Aegean near Ephesus/Selcuk, water from Bosphorus, the sea of Marmara/both from Istanbul, rainwater from Aya Sofya & Topkapi Palace/Istanbul, fountain of the Blue Mosque. VENEZUELA: Spring of Apparitions of the Virgin Mary/Betania. WATERS from Ceremonies and Celestial energy: Solar Eclipse 1999, Full Moon Eclipse 2000, Harmonic Concordance 2004, Full Moon Winter Solstice 2007, Sound Essences G#,F#,D#, Divine Mother and Healing Burned Woman Ceremonies, Goddess Ceremonies, Anchored Venus Transit of Love, Hathor Intensives, Great Central Sun Initiation, Aethos of Non-duality, Clearing Birth Blueprint. Art of Egyptian High Alchemy, Art of Seeding New Realities, Mary Magdalena Ceremony, Ocean of Gratitude Cruise 2006 with Dr. Emoto, Gather the Women ceremony 2016, Solar Eclipse 2017.